Anyway, I mentioned last week that I have some special guest posts coming up and today is time for another one. 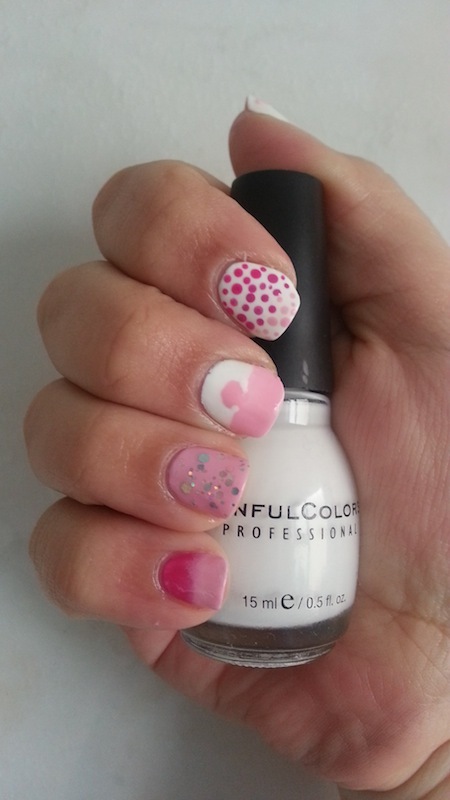 Michelle loves pink and hearts, she also has a big heart and I wanted to show her love for nail art and others by incorporating hearts into my mani. 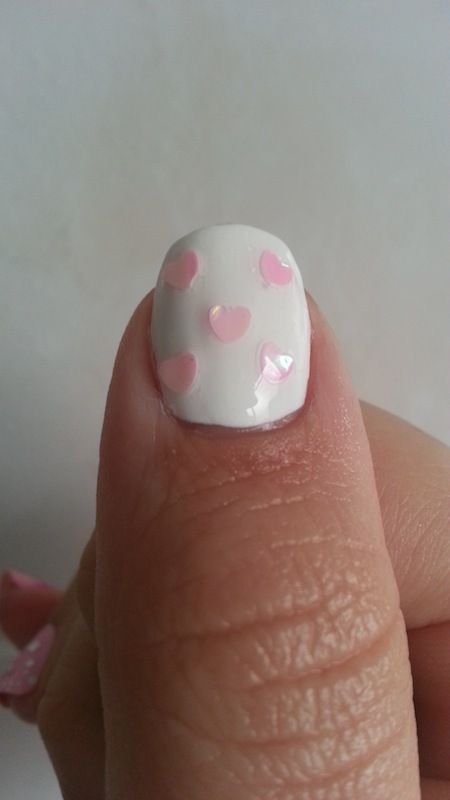 I used a base of Sinful Colors Snow Me White and “glued” holographic nail art hearts onto the nail and covered it with a generous amount of top coat. Michelle is crazy about dots and I love gradients, so I thought I’d combine our favourites. Of course, the dots had to be pink. Again the base is Snow Me White. The dots closest to the cuticle are Yardley Gel-lac Fuchsia. The middle dots are Maybelline Forever Strong Busy Blush. The dots closest to the tip are Tip Top Melting Marshmallows. Incidentally, Michelle sent all of these pinks to me as gifts (told you she had a big heart). Here I used a base of Snow Me White and used Tip Top Melting Marshmallows to (try to) create a puzzle piece. Michelle thinks she is a misfit, but I think she fits perfectly into the lives of people who take the time to get to know her. She really is a gem. I loved Tip Top Melting Marshmallows from the moment I saw it on Michelle’s blog, when she sent it to me, she also started another love affair when she included Tip Top Rocky Road glitter. Michelle was never a big glitter fan, but we are slowly winning her over and that is what this nail represents. Here I layered the Rocky Road over Melting Marshmallows. Here I used a base coat of Snow Me White and used Yardley Gel-lac Fuchsia and Tip Top Melting Marshmallows to do the ombre. Thanks so much for having me, Michelle and thank you for helping me discover a wonderful new hobby that brings me so much joy. Thank you so much for the VERY special mani! I love it! I agree Lauren! It’s gorgeous! Thanks Imka, I agree. I love it! Thanks Desle! I agree, it’s beautiful and so special! You ladies make me want to be more vocal about my nail painting hobby. Well, more vocal than outside of instagram…. SheBee recently posted…Vis vang, julle. It’s my favourite one as well!!!!! I LOVE it! I love this mani! My favorites are the puzzle piece and the dotty gradient. Stunning Heather! Super sweet. I love it!